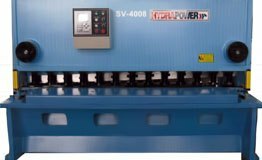 SV Series; the SV Variable Rake Hydraulic Plate Shear - from 8' x 1/2" through 30' x 11/2"
Squaring arm extended to 96", 120" or 144"
Increased throat gap - 12" or 18"
The machine must not be operated without point of operation guarding. It is the responsibility of the user to insure the machine is operated safely and has appropriate guards for the type of work being performed. 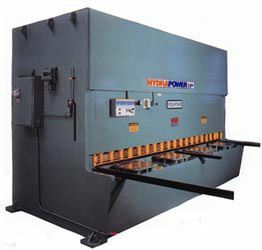 The manufacturer can not satisfy the guarding requirements for the many and varied applications these machines can perform. The manufacturer will assist the purchaser with his selection of guarding and will offer factory installation of the guarding selected by the purchaser. The entire hydraulic system is to JIC standards and makes maximum use of flared fitting and "O" Ring seal connectors. All valves are flange mounted or cartridge type components to simplify servicing. The motors and pumps are direct coupled by a bell housing to reduce noise and insure perfect alignment. The control panel features a lockable mode selector to provide "Off", "Inching" and "Single Cycle" functions. In the Off position the machine is completely inactive. CNC control of motorized knife clearance adjustment for instantaneous clearance changes. The position indicator shows from minimum to maximum in inch or metric plate thickness. Following knife regrinds the indicator can be easily calibrated to show the appropriate new positions. The stroke length may be adjusted to reduce cycle time and increase productivity on shorter work by as much as an additional 250%. The machines are equipped with a 48" range CNC back gauge. Fully sealed pre-lubricated gear boxes are driven from the self locking reduction box. On both output shafts of this gearbox are two indexing couplings which provide a simple and convenient means of adjustment to compensate for any back gauge misalignment. The gear drive finally rotates two rolled acme screws which position the gauge bar. Changes in the rake angle can readily be made to enable the shear to speed productivity by shearing thinner metal at low rake angles, requiring less stroke, resulting in faster cycle time.